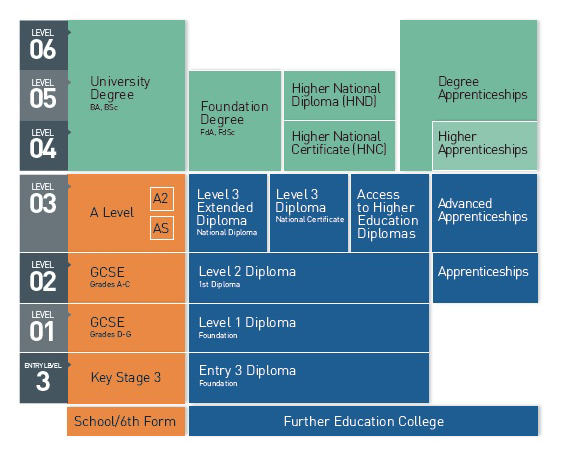 There are many different qualifications available today and you may need some assistance in choosing the right course. Decision-making is not always straightforward. It will depend upon your style of learning; whether you would rather have an academic classroom environment or a more practical approach and, of course, where you’re heading in the future is also important. The information in the table shows the different types of qualfications available and what they're equivalent to. In addition to traditional academic courses, you will see that The College has a wide range of professional and technical qualifications offered at different levels. These courses and qualifications are designed to build on the skills, interests and aptitudes you have to help you progress to a job, an Apprenticeship or to Higher Education / University. Did you know our Advice and Guidance Team work in partnership with the National Careers Service to offer free and impartial advice. They can help you decide which course and level is right for you.